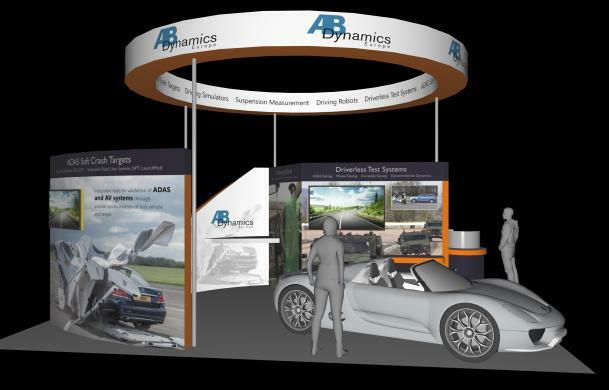 AB Dynamics, one of the leading suppliers of advanced automotive test systems, will be showcasing their latest developments including LaunchPad, K&C inspect and the riderless motorcycle at the Automotive Testing Expo 5-7 June Messe Stuttgart, Germany. LaunchPad is a self-propelled platform allowing complex movement and accurate, choreographed control of all VRU targets including pedestrians, cyclists and even animals in ADAS and autonomous vehicle testing. K&C Inspect allows users to capture the movement of up to 50 target points in three dimensions which is then automatically synchronised and recorded with the traditional data collected during K&C testing. The riderless motorcycle allows autonomous cars to be tested under much more challenging and representative conditions. AB Dynamics’ cross-platform Synchro technology allows coordination of the motorbike with other moving elements. Also on show will be its wide range of driving robots along with the aVDS – a revolutionary simulator capable of reacting to the smallest changes in vehicle configuration due to the high-performance motion platform and high specification audio and vision system combined with world class content. Make an appointment to see us by emailing joanna.maddams@abdynamics.com or just pop along to Stand 8314.